In a leading example of stewardship in water management, the Gwinnett County Board of Commissioners, in partnership with Ostara Nutrient Recovery Technologies, has officially opened a nutrient recovery facility at their F. Wayne Hill Water Reclamation Center (WRC), the county’s largest wastewater treatment facility. Continuing Gwinnett County’s resource recovery program, Ostara’s Pearl® nutrient recovery process at WRC will help protect freshwater lakes such as Lake Lanier by recovering phosphorus and other nutrients from the wastewater streams and transforming them into an environmentally responsible fertilizer, marketed as Crystal Green®. Gwinnett County Board of Commissioners Chairman Charlotte J. Nash and Environmental Advocate and Attorney Robert F. Kennedy, Jr. officially opened the facility following a brief ceremony. Ostara’s nutrient recovery process will help the county maintain phosphorus levels below nutrient loading limits and protect local waterways, mitigating one of the planet’s most critical environmental challenges: the proliferation of algae blooms that debilitate waterways and destroy aquatic life. 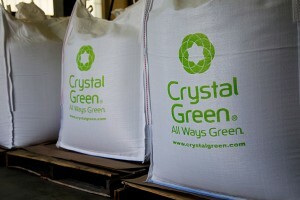 The Crystal Green fertilizer – and its unique mode-of-action, releasing nutrients only when the roots need them, meaning lower application rates, and reduced nutrient loss through leaching and runoff – also has a positive impact for the County. “The benefits of the fertilizer, both in the way it is produced and applied, supports Gwinnett County’s stewardship goals of nutrient recovery, energy capture and water conservation. We are excited to partner with Ostara to take our resource recovery program at the F. Wayne Hill Water Resources Center a step further,” concluded Nash. By recovering potentially polluting nutrients from the treatment facility’s wastewater stream and converting them to slow-release fertilizer, Ostara’s technology helps the county increase operational inefficiencies by avoiding struvite build up. Struvite is a concrete-like mineral deposit that builds up in pipes and on equipment in wastewater plants, leading to decreased efficiency of the entire wastewater treatment process. Although chemical additives can temporarily relieve struvite problems, it is a costly solution that also generates solid waste requiring disposal. Overall the Ostara system, known as the Pearl process, will recover more than 85 percent of the phosphorus and 40 percent of the nitrogen from nutrient rich process streams before they accumulate as struvite on pipes and equipment. Using two of Ostara’s Pearl 2000 reactors, Gwinnett County’s nutrient recovery facility has an annual Crystal Green production capacity of up to 1,400 tons. The County will receive revenue for every ton of fertilizer it produces. In addition, the nutrient recovery facility will create annual cost savings in chemicals, solid waste disposal, maintenance and power.